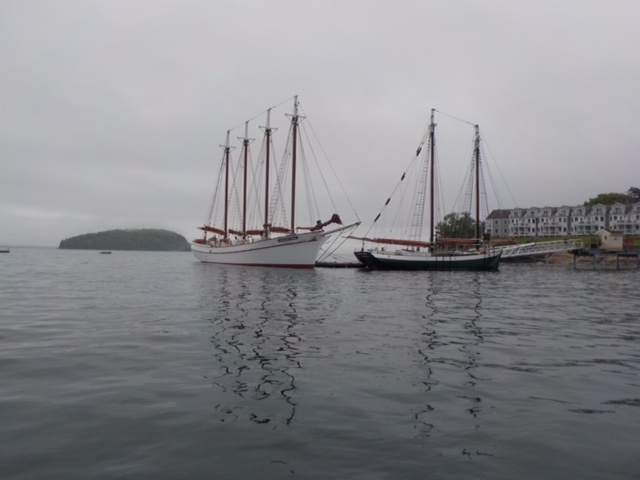 This was our first visit to Bar Harbor and I hope it will not be our last. It's a great destination and the folks at the Bayview made it all the more special with their warm welcome and attention to detail to make our stay truly memorable. After a delicious breakfast served in the main building (above) we went for a stroll along the water's edge. Another resort with spectacular sea views. Lots of people out enjoying this walkway. Private home with a view. The circle route brought us back to the downtown section that is a wonderful mixture of diverse shops and restaurants. We did our fair share of window shopping, but the moose standing guard on this rooftop caught my attention. Do you think it is illuminated at night? All three mornings of our stay the town and harbor were cloaked in fog, but rather than being a deterrent it just added another layer of charm to this part of New England. 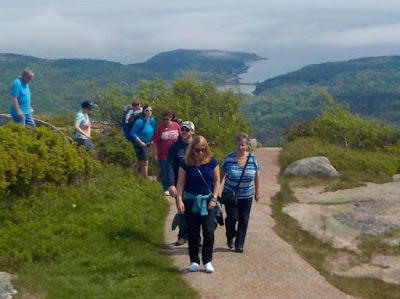 We also explored more of the island most of which is part of Acadia National Park. When it came to this steep set of stairs, however, I opted to stay behind while John, Sarah and Tim headed down to the beach. It's not so much that I'm lazy or completely out of shape, but rather I caught a dreadful cold on the flight home (think plague, it was that bad) and on this particular day I'd simply run out of steam. They did take some lovely shots of the beach so in a way I got to see it anyway. We also drove to Mount Cadillac and the views were spectacular. The cloud covered islands reminded me of cupcakes with a delicious icing frosting! Last but not least we walked to another beach, again shrouded in fog. It was a lovely long weekend at a spectacular destination with my three favourite people in the world. Life doesn't get much better than this.